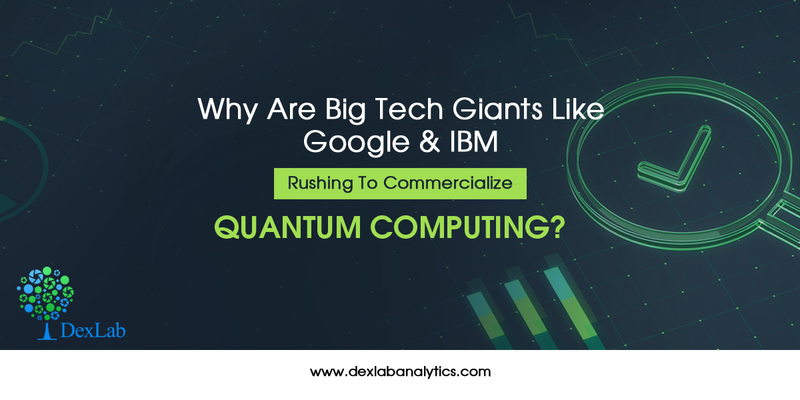 Quantum computing is all set to make a debut in the commercial world – tech bigwigs, like IBM and Google are making an attempt to commercialize quantum computing. Julian Kelly, a top notch research scientist at Google’s Quantum AI Lab announced with a joint collaboration with Bristlecone, a quantum processor that offers a testbed for various research activities on quantum technology and machine learning, quantum supremacy can be achieved and this could be a great stepping stone for building larger scale quantum computers. After Google, IBM is also making significant progress in commercializing quantum computing technology by taking it to the cloud in 2016 with a 5 qubit quantum computer. Also, last year, November they raised the bar by declaring that they are going to launch third generation quantum computer equipped with a 50 quibit prototype, but they were not sure if it will be launched on commercial platforms, as well. However, they created another 20 qubit system available on its cloud computing platform. Quantum computing has seeped in to an engineering development phase from just a mere theoretical research – with significant technological power and constant R&D efforts it can develop the ability to trigger a fourth industrial revolution. Areas where conventional computers fail to work, quantum computing will instill a profound impact – such as in industrial processes where innovative steps in machine learning or novel cryptography are involved. Revenues from quantum computing are expected to increase from US$1.9 billion in 2023 to US$8.0 billion by 2027 – as forecasted by Communications Industry Researchers (CIR). The scopes of quantum computing have broadened beyond expectations – it has expanded to drug discovery, health care, power and energy, financial services and aerospace industry. To incorporate quantum computing into the heart of the business operations’ computing strategy, the companies are contemplating to add a new stream of revenue by implementing quantum computing via cloud. In the future, it’s expected to see a rise in on-premise quantum computing – because the technology is already gaining a lot of accolades. In the current scenario, the quantum enterprise market is still at a nascent stage with a large user base in the R&D space. But by 2024, it has been forecasted that this share would be somewhere around 30% and the powerful revenue drivers will be industries, like defense, banking, aerospace, pharmaceutical and chemical. IBM or Google? Who is a clear winner? As last notes, quantum computing has come out from being a fundamental scientific research to a structural engineering concept. Follow a full-stack approach, coupled with rapid testing and innovative practices and establish winning control over this future tool of success. In this endeavor, DexLab Analytics can for sure be of help! Their business analytics certification online courses are mindblowing. They also offer machine learning using python courses and market risk training – all of them are student-friendly and prepared after thorough research and fact-finding.